Franciscan Focus: Ten years of marriage! [On the wedding night, Sarah] got up, and [she and Tobiah] started to pray and beg that deliverance might be theirs. He began with these words: "Blessed are you, O God of our fathers; praised be your name forever and ever. Let the heavens and all your creation praise you forever. Ten years ago today, Husband Mike and I were joined together in the Sacrament of Holy Matrimony. Pretty astonishing to think that this makes a full decade ... 10 years' worth of serious and silly arguments. Sicknesses, surgeries, and stress. Scintillating conversations with topics like, "Why Are There Toenail Clippings All Over The Bathroom Floor?! ", "It's Your Turn To Clean The Cat Litter", "What Do You Think, Are Those Leaves In That Hairball? ", and "Wake Up, The Cat Just Puked In The Bed". Silent treatments. Slapstick hilarity at 3 a.m. Funerals, weddings, baptisms, and First Communions. Anxious hours spent in emergency animal clinics with ill cats. Vacations, car purchases, joint tax refunds. Midnight pharmacy runs to soothe each others' coughing misery. Struggles to communicate. Lugging out the recyclables. Laundry. Snuggling close on cold nights. Ten years ago, I had only recently moved out of my Raging-Feminist-I-Hate-The-Evil-Bad-Patriarchal-Church mindset and back into the faith as a (then, not now!) semi-cranky, Cafeteria Catholic. 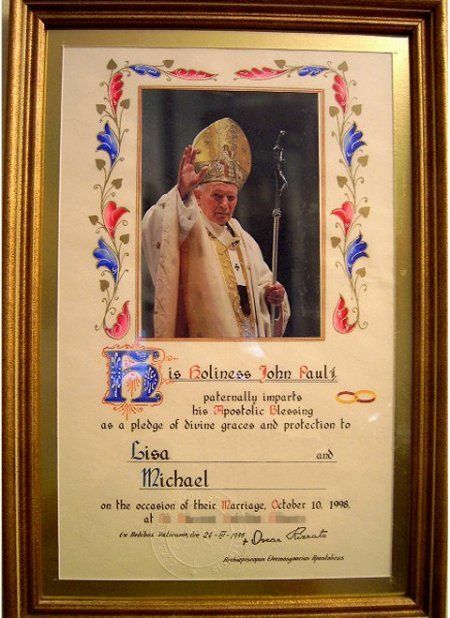 Why I took to the idea of having the Holy Father bless our wedding, I don't know; my history certainly didn't explain it. And nobody in either of our families had ever had or heard of them. All I know is that when I read about the blessings in some planning-your-Catholic-wedding-type book, I immediately knew we had to have one. And so, after mailing off the form, and lots and lots of waiting, we got our blessing. Since then, not a day has passed without me looking at it hanging there on the wall and thinking (however briefly) about how our marriage has something more surrounding it than just our love. Now, I know that the Holy Father didn't personally have us in mind with the blessing; I'm sure it was part of a general blessing to cover a multitude of occasions and people. Still, I suspect his pledge of "divine graces and protection" to us has counted for something. May God continue to bless you both! You should feel special, I dont "Woot" for just anyone! Marriage should be something beautiful - even miraculous. In this day and age a marriage that lasts until "death so us part" certainly seems miraculous. I have heard that people should choose a spouse who will help you get into heaven. Many of us get married without knowing that piece of advice. It seems like you both are traveling on the right road, and it will reach a much higher place. Congratulations, happy anniversary, and may God bless you with many more happy, healthy DECADES together! Beautiful post. Congratulations on 10 years of marriage. I can relate to your journey, it sounds like my own. Too bad Bill and I never heard of a papal blessing on our marriage, it might have helped us open our eyes sooner to the good that God was doing in our marriage, and the graces we were receiving. We spent a long time in the dark. But the 70's - 90's were dark times in the Church. Thank God the 20th century has come to an end. (I am thinking of Pope Leo XIII's vision) Hooray for the 21st!